Scores of Rohingya people leaving Bangladeshi camps by boat have accidentally returned to the crisis-hit area of Myanmar they originally fled from, after their vessel broke up on the sea route south. Around one million Rohingya have fled Myanmar army crackdowns since 2016 for Bangladesh, where they live in cramped, flood-prone camps now being battered by the seasonal monsoon. 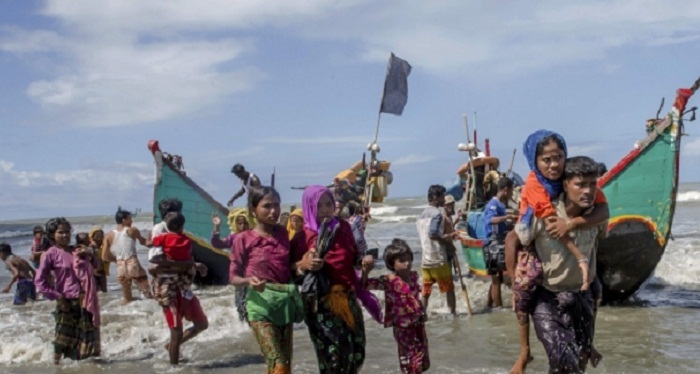 On Monday morning a boat carrying 104 Bangladeshis and Rohingya ran into trouble off the coast of Rakhine state, a Myanmar government spokesman told AFP, eventually breaking apart and forcing the passengers to head for shore. The vessel was believed to be relatively close to the coast, enabling the refugees to survive. For some it is likely to be an unexpected and unwelcome return to a state they were forced to run from, carrying accounts of atrocities by Myanmar's army and ethnic Rakhine Buddhists. "These Muslim people were going from Bangladesh to Malaysia by the boat owned by a Malaysian man," spokesman Zaw Htay told AFP on Wednesday. "Some are Bangladesh citizens, the majority are from the camps... people from Bangladesh who fled," he said. Myanmar denies the Rohingya citizenship and officials do not recognise the term, instead labelling them "Bengalis", shorthand for illegal infiltrators from the neighbouring country. They were taken to Nga Khu Ya camp in Rakhine's Muangdaw district - a purpose-built facility meant to process refugees returning under a discredited repatriation deal with Bangladesh. Photographs showed the passengers -- including women and young children -- walking barefoot into Myanmar police trucks with virtually no possessions and drenched under heavy rains. Passengers had paid people smugglers around $235 to ferry them to Malaysia with the promise of another $2,100 once they were able to find work in the Muslim-majority country, Zaw Htay added. Tens of thousands of Rohingya and Bangladeshi economic migrants are believed to have died at sea in recent years trying to reach Malaysia. The well worn trafficking route collapsed in 2015, when shallow graves were found at migrant holding camps across the Thai-Malaysian borders. But boats still make the journey south. After checks Myanmar will send back the Bangladeshis, Zaw Htay added, and submit the rest for repatriation process to Myanmar "if they want to follow it". Rakhine state remains cut off from independent access, and the UN says conditions there are not right for a safe, voluntary and dignified return. But the UN signed an agreement with Myanmar last week to begin assessing conditions there -- in a bid to help refugees make an informed decision about returning. On Wednesday the new UN Special Envoy to Myanmar Christine Schraner Burgener met Myanmar's de facto leader Aung San Suu Kyi in Naypidaw. It is the envoy's first visit to the country as relations between Myanmar and the UN show signs of repair following months of recriminations.